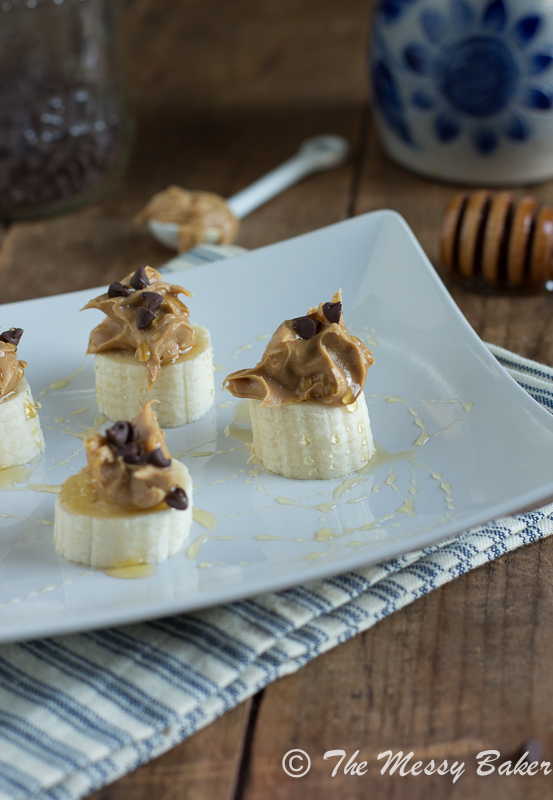 Thick slices of banana topped with a dollop of peanut butter, sprinkled with mini chocolate chips, and drizzled with honey. They’re the perfect healthy snack to satisfy your sweet tooth. I could eat all day long if someone let me (that someone being me, of course). When I was younger, my great grandmother encouraged me to eat. You could never eat enough food in her presence, which is probably why I’ve grown to be such a great, and abundant, eater. The woman knew the way to my heart, and I adored her for it. I was lucky to live only a few minutes’ walk from her house. I would ride my bike to her house a few times a week to watch her work her magic in the kitchen, knowing that I would be fed handsomely when the meal was finished. Every time I would visit, she would pull everything out of her refrigerator—every last smidgen of food—and line her kitchen table with bowls, platters, casseroles, and plates loaded with food. The woman loved to cook and, even more, she loved to feed people. I would stand at the table, a plate in one hand and a fork in the other, contemplating where to begin first. Now that I’m older, I can no longer fill a table with food and graze until the button pops off my Levis. Oh, how I miss those days when my metabolism was booming and I could eat everything in sight without gaining an ounce. I’m verging 30 (oh, that dirty word), which means healthy snacking and routine exercising to stay healthy and ensure that I fit into my ever-growing wardrobe. These days, I stock my fridge with healthy fruits and veggies, low-sugar and low-fat goodies, and tons of lean protein. I still set a mean table; however, it involves less cake and more greens. I can’t really call these banana peanut butter stackers a recipe. There’s no measuring, sautéing, whisking, or baking involved. We’ll call it a no-recipe snack. I happened to be desperate for a snack the other day, and these stackers were result of rummaging through my cabinets and pantry to satisfy my sweet tooth. One bite and I knew I had to share them with you. Peanut butter, chocolate, and banana are the perfect combination of flavors. If you have a fierce craving for something sweet that just can’t wait, this is the snack for you. 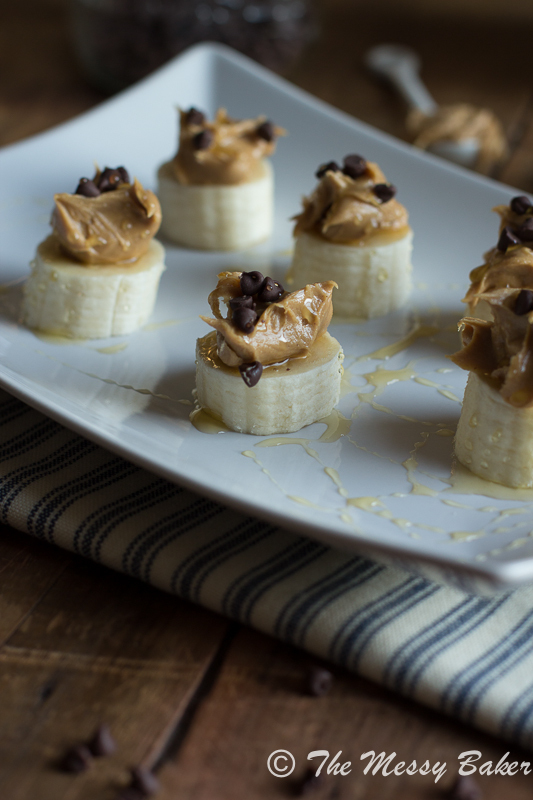 Cut a banana into chunks, add a dollop of your favorite peanut butter, sprinkle with a few mini chocolate chips, and drizzle with sweet honey. It’s that simple. I eat this snack to fuel up before I go for a run. It keeps me energized without feeling bloated. These stackers make a perfect after-school snack for the kiddos. Cut your banana into 1/2-inch thick slices. Top with a dollop of peanut butter. Sprinkle each banana stack with a few mini chocolate chips. Drizzle with honey. THese snacks are perfect for studying! Thanks, Uru! You gotta fuel your brain. 2.0 likes to get up in the middle of the night, slather peanut butter on a banana with chocolate chips, eat it, and then crawl back into bed. Nine times out of ten, I wake up and wonder: why does our bedroom smell like peanut butter? I think 2.0 should bottle that scent. Who knows, it could be the next trendy scent. What a fun snack! Growing up, on of my favorite sandwiches was PB with banana slices. I’m sure I would love this – especially with the little drizzle of honey! Thanks, Jamie. I adore pb and banana sammies. When I’m feeling frisky, I add a dollop of mallow cream. These are a perfect snack! You get a bit of chocolate and sweetness without going overboard! Thanks, Jess. I couldn’t agree more. thank you!! I have been racking my brains for a new after school snack! You’re very welcome. Your kiddos will love it! Peanut butter and banana is one of my favorite combos. 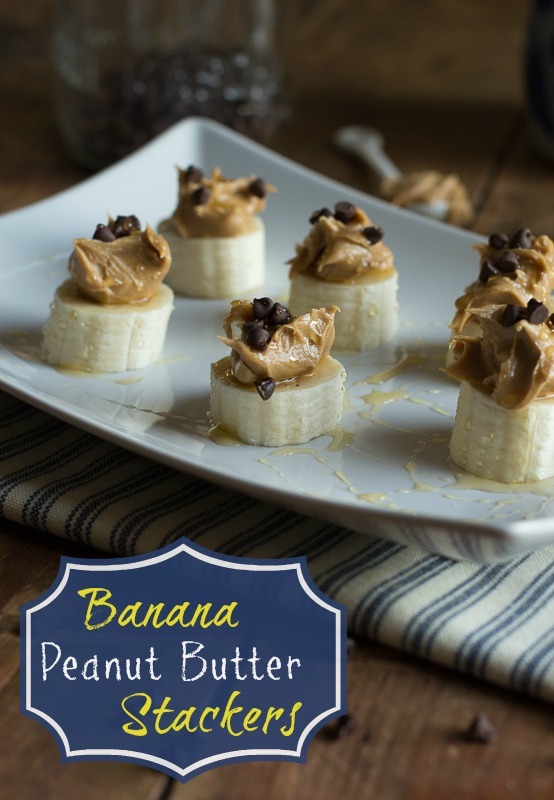 These look so good…I wish I had a banana at home now because I would totally make these for my midnight nursing snack! Awww your great grandma sounds like such a sweetie! And these banana stacks look like the nummiest little snack ever! 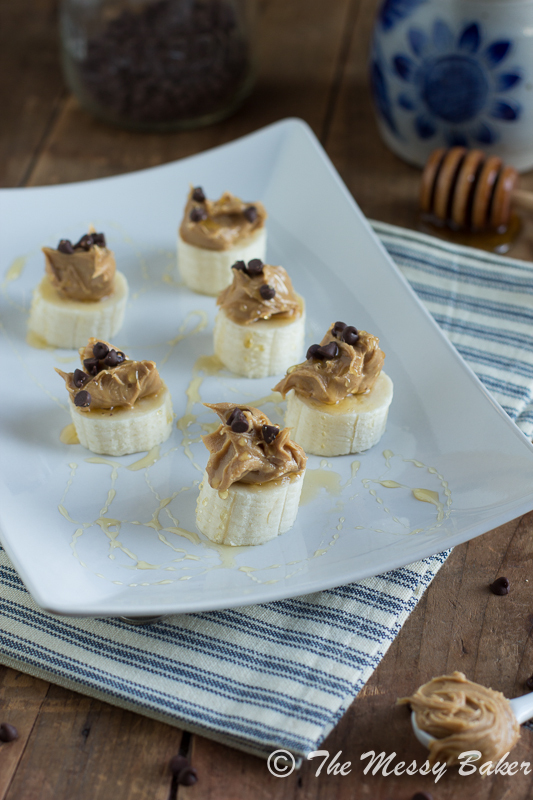 I love bananas, pb, choc, and honey–all things win! Been eating a ton of almond butter and bananas recently, but I haven’t drizzled honey on top. Can’t wait!! Oh my gosh! What a fun way to eat your nanners! I could consume quiet a few of these little stackers! What a perfect energizing snack that also satisfies a sweet tooth :) I made something very similar once, and my husband laughed at me. Men. haha. Men have no idea, Lori. Thanks! This is the only way I can get my youngest to eat her bananas. 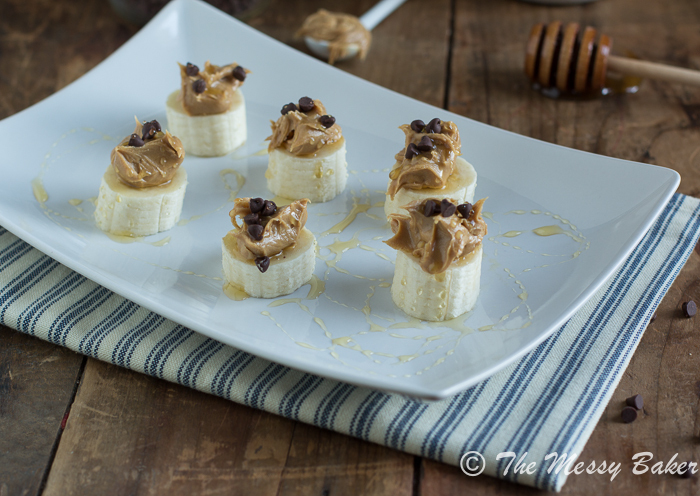 We often keep them whole spread a bit of PB on the top, sprinkle with mini chocolate chips and call it a “banana boat” The kids request that daily!